This video explains the enormous healing benefits one patient has experienced from juicing the fan leaves of marijuana to extract the cannabinoids. There are many more patients claiming they have experienced healing benefits from juicing marijuana. 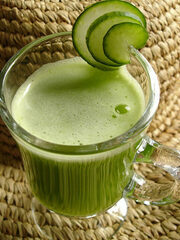 When juicing, the fan leaves are used and the plant material is not heated, therefore the juice is not psychoactive. Juicing with a strain of marijuana high in CBD is thought to be especially helpful. Run all ingredients thru the juicer for a satisfying and healthy drink that patients report as a healing cocktail with pain relief effects lasting 4 - 6 hrs. The THCA is not converted to THC as this recipe is using FRESH undried fan leaves, and therefore has no psychotropic effect.